It can happen suddenly. One minute you are browsing the aisles at your local grocery store and the next, you’ve slip and hit the ground. Slip and fall accidents happen more frequently than people realize and often times can cause severe injury. In somes cases, these falls may be the fault of the property owner or manager. In those instances, you may have a case to get compensation for your injuries. 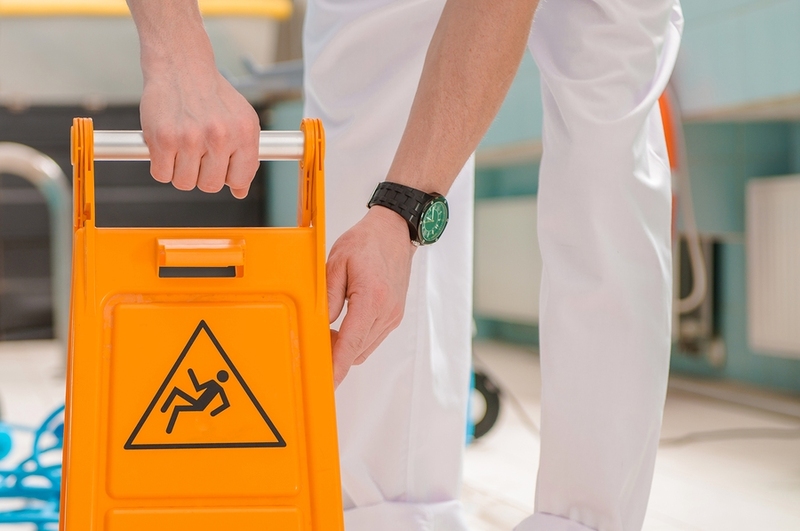 How Do Slip And Fall Laws Work? In the state of Florida, slip and fall law falls under the category of a personal injury case. They usually happen on property or premises that are owned or maintained by someone and the property owner is held legally responsible. It is the responsibility for you, the “plaintiff” to show that the owner, the “defendant,” did not act in a reasonable manner, that is, they were negligent. For example, it is reasonable for grocery store to mop up any spills in their aisles. What Is Considered Negligence In A Slip And Fall? Unless it is a rare case involving intentional conduct by the defendant, a slip and fall case will require you, the “plaintiff” to prove negligence. Negligence means that the defendant failed to act in a reasonable manner under the circumstances. For example, it is reasonable to expect a store clerk will place warning signs around a recently mopped area. If this is not done, and a customer slips on the wet floor and gets hurt, the store may be liable for negligence. These are just some of the examples, an attorney can help you determine if your fall is the result of negligence. Do I Need A Lawyer After A Slip And Fall? It is of vital importance that you contact a skilled personal injury attorney as soon as possible. There are many aspects to filing a negligence lawsuit. Without a good lawyer and legal team it is difficult to get all the necessary evidence to prove the defendant knew that the area was a potential danger. It is up to you and your lawyer to prove that the property owner is negligent. Hiring a personal injury attorney also puts the other party on notice that you mean business. What Happens When I Meet With The Lawyer? ●	The owner or possessor of the property created the condition. ●	The condition that caused the injury existed long enough for the defendant to have seen it and corrected it before your fall. ●	The defendant knew the condition existed and did not correct the condition to make it safe. ●	That the condition that the defendant did not correct was a condition that a “reasonable person” would have fixed. •	Gathering Information: Your attorney and their staff will begin to collect medical data, interview witnesses and complete all paperwork. In addition they may send you to their specialists to determine your injuries. •	Issuing A Demand Letter: This is where your attorney will file the lawsuit and present a demand to the defendant’s insurance company. •	Discovery: this is when both parties disclose all information about the case to the other party. You may also be interviewed by the defendant’s lawyer. •	Negotiation: The negotiation period is when your attorney and the insurance companies negotiate for the value of your claim. •	Settlement: Once an agreement is made during negotiation, you will be granted a settlement for your damages. If the defendant/insurance company does not settle for a fair amount, you may then take the case to trial to fight for fair compensation. The lawyers at All Injuries Law firm have 30 years of experience protecting slip and fall accident victims. They are known throughout the Port Charlotte area for their excellent reputation and helped numerous victims like you. If you want to learn if you have a case for your slip and fall accident, call us today at 941-625-HURT for a free case evaluation.